The Thuringian Forest Goat is endangered, and now only about 300 purebred animals remain alive! 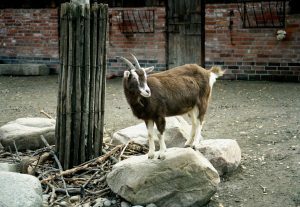 Extremely useful animals, Thuringian Goats remain a favorite of enthusiasts. Thuringian Goats have been a favorite since the beginning of the century because of their extreme vigor. They have been used conventionally to finish rough fields, and can survive well on poor or sparse graze. Thuringian Goats are extremely good mountaineers, and are agile and sure-footed, needing little care. At maturity, a Thuringian Forest buck usually weighs about 55 kilograms, and females weigh about 48 kilograms. Males stand about 78 centimeters at the shoulder, and does follow at around 74 centimeters. They are available in horned and polled varieties. Coat-wise, there are also two varieties: fine and coarse. The hair is short to medium in length, and it lies flat and close next to the Thuringian Goat’s body, providing an effective insect repellent! Generally, Thuringian Goats are brown in color but the shades vary, and black goats are possible. There are white markings on the Thuringian Goat’s lower legs and ears. The face is generally paler in color and there are white facial stripes from the eyes to the muzzle! Often, there will be a white spot on the rump area. Thuringian Goats are good milkers and can produce 700 to 1,000 kilograms of milk over the course of a year. Usually, the fat content is around three and a half percent. Thuringian Goats are also used for meat, and have lean carcasses with a high yield. In the early 1900’s, farmers in the area of Thuringia began improving the Thuringian Landrace Goats by crossing them with Swiss Toggenburg Goats. In fact, Thuringian Goats are often called German Toggenburg Goats! Previously, experimental crosses had also been conducted. In 1885, Thuringian Landrace Goats were crossed with local breeds like the Harzerziege and Rhönziege Goats. The herd book was established in 1935 and Thuringian Goats enjoyed brief popularity. They are also known as Thüringer Waldziege and Thüringer Wald Goats. 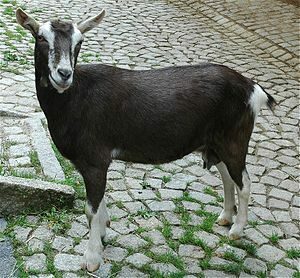 The Swiss Toggenburg was also recrossed into the breed as late as 1988, and the number of Thuringian Goats began to decline. Today, there remain only about 300 purebred Thuringian Goats and preservation and artificial insemination programs have been instituted. In show, Thuringian Goats will be disqualified for a dorsal stripe or any markings resembling the Oberhasli breed. Red colorations are also taboo. These goats are renowned for their forage finishing abilities and disease and parasite resistance. Thuringian Forest Goats breed once each year. Usually, they birth twins, but triplets are possible. They reach sexual maturity at an average age and have a decent length of mating season. Thuringian Goats have kids with lower daily gain rates than most other breeds.